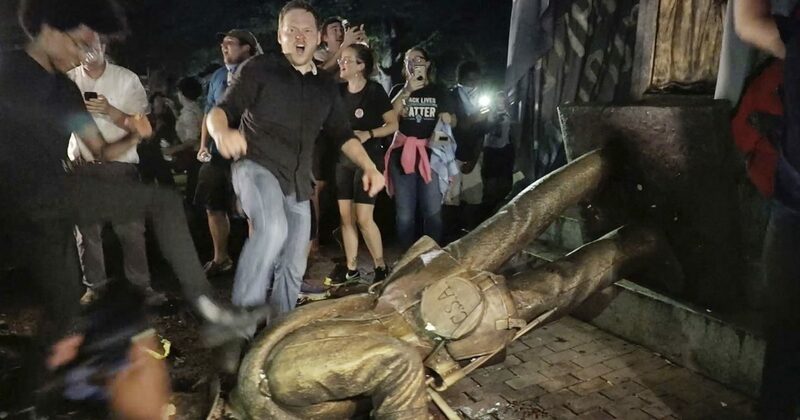 A few days ago the League of the South cancelled their September 29th rally in Tennessee, the purpose of which was to protest the desecration of the Silent Sam Confederate monument at the University of North Carolina, by a pack of what can only be described as wild savages and demonic communist sodomites. My major peeve about this cancellation is that it ruined a perfectly good opportunity for me to hang out with my best friends, and fellow veterans of the 2017 Battle of Charlottesville: The New Jersey European Heritage Association. Of course there’s also the fact that our 1st Amendment rights were held up for ransom by the state government of Tennessee and the local government of Johnson City. According to an article written by Dr. Michael Hill (President of League of the South) the Tennessee government demanded the purchase of a $4,800 insurance policy for the rally, as well as the acceptance of an “open-ended bill” for security provided by the police. In other words, they expected the League of the South to write them a blank check for the privilege to speak out publicly about the desecration of our Ancestors’ monuments. What a joke, that cops think we owe them extra payment for them to do their job and protect our basic civil rights. We already pay the cops’ wages with our tax revenue, and apparently they can’t even perform basic tasks necessary to maintaining law and order in this country. Now we should be asking ourselves why we pay them at all, since they want to hire out as mercenaries on the side. I have to say, this is feckless and yellow-bellied behavior on the part of the government of Tennessee. Maybe the reason why they permit the dishonoring of the heroes and veterans of our nation… is because they viscerally and probably very consciously understand that the men of older and greater generations would look down upon them with disgust, disavowal and the intense urge to fix bayonets and spill the guts of these sniveling traitors who fancy themselves fit for “leadership” in a country that legendary men have fought and died for. Ironically, these modern cuck politicians are essentially recreating the tyranny of Lincoln that the Confederates fought against. Like Lincoln, they have effectively stifled the 1st Amendment. They permit political violence committed by communists and use it as a pretense to charge exorbitant fees to White men who wish to defend their cultural heritage. The Bolshevik styled behavior displayed by the government of Tennessee is something one would expect to see in Africa or South America, or some other tinhorn Marxist ‘democratic’ anarcho-tyranny. Political parasites drain the substance from White men in order to fund their sociopathic programs, which include the invasion of our society by foreigners and the erasure of our culture and history in favor of appeasing the crude, pugnacious sensibilities of primitive savages that were imported specifically to foment division and social upheaval in our nation. The establishment of our country now shamelessly indulges the freakish urges of degenerate communists, layabouts, perverts and effeminate liberal pseudo-intellectuals. The thing that most unnerves me is this question: in a country with no political or legal coherence, with a totally disparate and divided population, with a government steeped in treasonous behavior and anti-nativist attitudes… at what point does the line between treason and patriotism blur beyond distinction? What the hell even makes this a country anymore, when half the people living in it can’t speak the common language and are only here because they can turn a crank in a factory all day or push a broom for a few pennies? Their noxious, criminal presence and their leeching of our public institutions and treasury through welfare have been sanctioned by tired old liberal maxims contrived by Jewish intellectuals. This muddled moralism is used to disguise the dissolution of our country and willfully ignores the fundamental contradiction of its premise, for how can a “nation of immigrants” even be considered a “nation” at all? But perhaps to even ask such a question is to insult our own intelligence and the intelligence of our so-called leadership and even their knuckle-dragging stooges and hired goons. After all, who is really dumb enough to observe what is happening in this country and pretend that they don’t understand where it is leading? All of this self-destructive brinkmanship, escalation of political tension and criminal violence targeted at White people around the world is absolutely part of a trend and one that is clearly intentional. These Marxist idiots want to cause chaos, they want everything around them to collapse, they want to destroy and ruin as much of the world as possible. The only crimes recognized by the governments of our age, are the efforts of White men to save their own countries by exerting a sustaining force and reinstituting law and order and traditional culture. This is the only activity penalized by our crooked legal system. Politicians, cops, lawyers, judges and financiers are all just conspirators in criminal mischief and enablers of violent subhumans and insipid communist street punks who engage in petty transgressions against law abiding citizens, with the intent to maim and/or kill. This criminal conspiracy is one perpetrated by international Jewry and the Zionist cabal. These people are part of a doomsday cult that engages in every form of perversion and wickedness, with the express aim of flooding the world with evil and destroying everything noble, as part of their Sabbatean messianic plot. To the incredulous reader, know that what I have outlined is not to be considered speculation at this point; rather it is an open secret admitted by scores of public figures and officials. They don’t bother to hide it anymore. The White people of the world have been yoked by these devious bastards, and under their corrupt demonic tyranny our lives will only get worse until White men wake up to their Aryan essence, reclaim their inheritance and assume their rightful power in the world. Until we put our heel on the throat of this demonic self-destructive insurgency and restore order, the nightmare will continue and our country will be turned into an unrecognizable hellscape. I only pray that God will oversee our struggle and bless our efforts.